1, Various shortcuts - NUMLOCK, DEL, ESC, Tab, Home, End, Page up/down, bonus symbols keys and calculator export button, etc. 2, The keypad perfect for Excel Accounting, Financial transactions and professional design. Fit for accounting school and securities company. 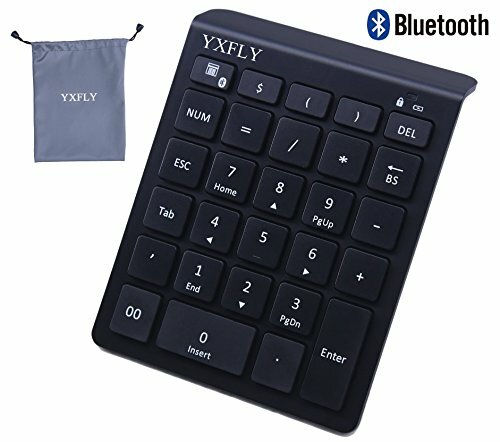 3, Free to get a storage bag to carry the numpad, this number pad is Lightweight and Ultra Slim, it is easily to carry into the storage bag. 4, This number pad support Smart Phone, Tablet PC and Laptop Desktop with Windows 2000/ Me/ 98/ XP /Vista/ 7/ 8/10 system. But it is NOT completely compatible with Android, Macbook OS and Apple IOS system. Calculator Key and Functional keys can not work except number key. 5, Please note: We did not supply Bluetooth dongle, if the Desktop or Laptop PC without Bluetooth function, you need to insert a third-party 3.0 Bluetooth dongle to install driver before use this number keypad. Item Dimension：3.3 * 4.3 inch + tilt angle 8"
1, Multiple Shortcuts Design: The number pad with 28 function keys including Multiple Shortcuts, Dollar Sign, Double Zero, Perfect for Financial Accounting Data Entry. 2, Power Saving: Unused about 10~20 mins, it will put into sleep mode, activating the number keypad just need to press the random key for 2~3 seconds. 3,Calculator for Computer: This numeric keypad with Calculator Shortcuts for Windows PC Laptop Desktop Notebook. 4, Ergonomic design: Ultra Slim and light weight, comfortable touch feeling, the numeric keypad works quiet. 5, Compatibilit: The Bluetooth number pad is perfect for laptop / Desktop with Windows 2000/ Me/ XP / 7/ 8/10 system. Please NOTE: Macbook OS and Apple iOS system is NOT completely compatible with Shortcuts and calculator, the former only work well with 10 number keys. If you have any questions about this product by YxflY, contact us by completing and submitting the form below. If you are looking for a specif part number, please include it with your message.